Plot – Lady Sarah (Weisz) and the down on her luck Abigail (Stone) begin a nasty rivalry for the affections of the cantankerous Queen Anne (Colman) in the palace surrounds of the Queen’s estate in early 18th centaury England. There’s no one out there making movies quite like Yorgos Lanthimos. Instantly familiar in spirit, tone and execution to his recent collection of well-regarded film’s that include the underground favourite Dogtooth, breakthrough The Lobster and the brilliantly eerie The Killing of a Sacred Deer, The Favourite once more sees Lanthimos instil his storytelling with a darkly and often completely odd humour that may not be for everyone but makes for spirited and engaging entertainment for all those that jump on board. 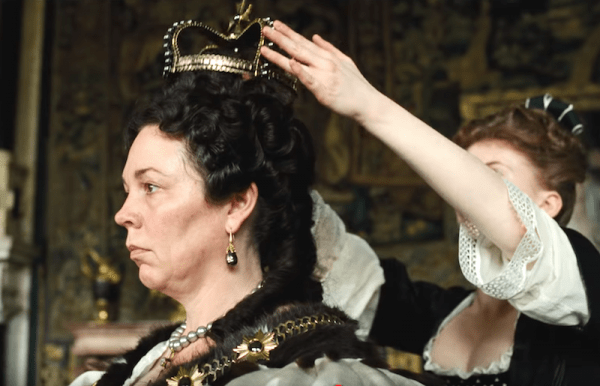 While not as intriguing as the totally unique Lobster or as skin crawling and unnerving as Sacred Deer, The Favourite is undoubtedly Lanthimos’s most assured and well-made film that is a beauty to behold, as well as the film most likely to garner its stars some serious awards love at this years Oscar’s. With its magnificent production design, costumes and sets, that combine perfectly with Robbie Ryan’s naturally lit and inventive cinematography, The Favourite is a joy to behold in all technical aspects and is a clear example of Lanthimos growing confidence in his craft, that in-turn allows his three female lead performers the opportunity to ply their trade on a well-founded stage. Lapping up Deborah Davis’s and Tony McNamara’s witty and often very adult dialouge that pokes fun at royal life and the day to day goings on of the upper class and obviously having a blast in meaty roles, these three lead performers are operating at the top of their game here and its fantastic to see Lanthimos continuing to employee actors of this calibre to his original outings. Where The Favourite does falter is in the story at the heart of the whole show. At times snail paced and less than entralling, the tale of this love/stature fight does take a while to really get going and while seemingly the goal, its hard to get overly engaged with these characters too deeply as they all remain throughout quite vile and unlikeable, even if some circumstance beyond their control have led them to be so, but never the less, without a genuinely likeable or redeemable figure, the enjoyment levels of Lanthimos film, no matter the quality of its craft or performing, will differ widely from viewer to viewer. There’s a lot to love about Lanthimos’s film in many of its aspects and while it’s a hard film to fall in love with character wise, this is the handiwork of a director and actors who are all on the top of their game, making The Favourite a well deserved awards darling. Sounds like we are very much on the same path for our thoughts Cindy! I would like to see his next film deal with some characters that are likeable! I will have to check that out! I have not seen him do that much press. It appears as though he has a great reputation in the industry as actors seem to be really keen to work for him! Yeh that is an interesting one that one! I think a case could’ve been made for either to be honest. It’s not very often you see three actors nominated for the same film, so the Favourite really did it well there. It’s great! I really do think they’re the best thing about the film! Weisz is probably the one that’s performance has gone most under the radar to, she was really solid. I definitely enjoyed it but out of Lanthimos’ last three films, I find it the weakest. Doesn’t quite have the bite or the absurdity he usually integrates. The Three actresses are fantastic though and Hoult was hilarious. 100% agree Dublin. I found the central story a little so-so compared to his other films but you are right that the three leads are all brilliant. I think they’re the reason so many people have fallen in love with this one.